Coventry Arms, the central landmark in Broadgate. Demolished in the 1920s to make way for the National Provincial Bank. During the demolition works Stone from Coventry Castle was reportedly discovered, along with a 14th Century fire place that was hidden under wooden panelling. The wooden panelling was later used to restore St Marys Guild Hall in the 1930s. A full history of the Coventry Arms and film are in the process of being complied. 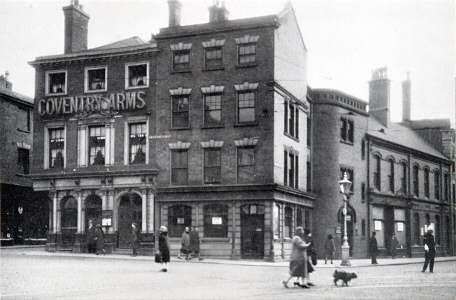 1903 – 1929 COVENTRY ARMS: According to the definitive guide to the history of Pubs and Beer Houses in the City of Coventry, the Coventry Arms went through various names prior to 1903, where we pick up the story. See the link below if you would like to know about the pub prior to 1903. 1904 28th September – Wanted a girl about 14 as Nurse Girl. Apply Newman “Coventry Arms”, Smithford Street, Coventry. 1905 2nd September Coventry Motor and Cycle Carnival – 4th Annual parade committee meet at the Coventry Arms to discuss the next event planned for October. 1905 14th October Coventry Cycle and Motor Parade – Another meeting by the committee. The plan for the parade was agreed – Assembly in the Barrack Square will be at 5 o’clock in the evening judging at 5.30 and starting at 6.30. There will be three stoppages bottom of Holyhead Road, corner of Lower Ford Street and Raglan Street and top of Bishop Street. 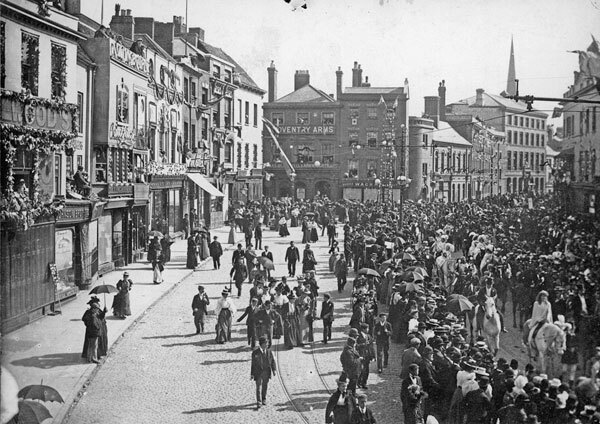 Money collectors were needed for the day during the procession – Boxes may be obtained from the Coventry Arms, the offices of the treasurer or 55 Springfield Road. 1906 9th March Second Hand Bicycle Wanted: must be in good condition and cheap. Apply Coventry Arms Smithford Street. 1906 28th September – Fire at the Craven Arms Stables, Mr Walter Newman the landlord of the Coventry Arms helped move a cab, but slipped and sprained his ankle. (History of the Craven Arms coming soon, including the fire and the fire Brigades Peeping Tom Engine). 1908 2nd January – Tickets for Coventry City F.C. and the Match with Crystal Palace – available from the Coventry Arms. 1908 28th July Mr Walter Newman licensee of the Coventry Arms runs for the Guardians Vacancy Radford Ward on the Coventry Board of Guardians. 1909 7th October – Licensing committee agree to the transfer of the licence from Mr Walter Newman to Mr Thomas Strong. 1909 12th November – Tickets for the Grand Northern Union Football Match in Coventry – St Helens vs Hull. kick off at 3 pm. 1910 3rd May – Coventry Northern Union Football Club First Annual Meeting held at the Coventry Arms. 1910 6th October – Celebrating the first win of the Coventry Northern Union F.C. Mr Strong hosts an evening of entertainment for the Coventry players. 1913 13th February – Bar General Wanted experienced and good references required. Coventry Arms, Broadgate. Coventry Arms T.Strong 86, H.G. Tett 70, E. Ingham 86, H Burton 100, E. Venn 100, Vz. Ranford 75, T Watson 100, Total 627. 1914 26th February – Wanted Waiter Saturday evenings – Apply Coventry Arms Broadgate. 1914 4th – 21st November Young Girl Wanted, Daily to take baby out – Coventry Arms, Broadgate. 1915 8th April Good Bar General Wanted – reference required Coventry Arms Broadgate. 1915 11th – 26th June Young Girl daily to take children out – Mrs Jeffrey Coventry Arms. 1916 25th February Bar General Wanted also general to assist in bar when required – Coventry Arms Broadgate. 1916 23rd February – Fire Brigades Meeting held at the Coventry Arms. 1916 28th August Married lady with baby, requires bed and sitting-room furnished – Apply Coventry Arms Broadgate. 1918 23rd – 26th April – Girl wanted for housework and assist bar Coventry Arms, Broadgate. 1918 12th July – Gertrude Driver, munition worker stole a pair of scissors valued at 2s 3d the property of the Ministry of Munitions. Miss Driver was further summoned for receiving from a person unknown a metal tankard value 10s belonging to Thomas Strong of the Coventry Arms Coventry. She stated that she went to have a drink, and a man handed her the mug. Miss Driver refused to take it from the man, but when on the tramcar the man offered it to her again she put it on her lap. For the theft the girl was fined 25s and costs. 1918 10th October – Bar General Wanted, also Cook General Coventry Arms, Coventry. 1919 12th March – Mr Strong objects to a restaurant “Black Cat” 56-57 Hertford Street having an alcohol licence. Other objectors included Mr Nelson on behalf of the Coventry and District Licensed Victuallers Association, Mr Wilford the licensees of the Railway Inn, Mr H I Mander on behalf of the Coventry District Free Church Council and the Coventry Branch of the British Women’s Temperance Association. Who would want to drink alcohol while eating a meal at a restaurant? 1919 29th May – Girl Wanted for housework and assist bar in evenings Coventry Arms Broadgate. 1919 5th July – Mr Strong charged with driving a motor car at speed dangerous to the public in Greyfriars Lane, Smithford Street and Broadgate, on the night of June 19th 1919. Mr Strong was reported to be driving near Broadgate at 10-30 pm on June 19th. Coming out from Greyfriars Lane with full lights burning at a terrible speed. The engine was roaring and all out, and apparently travelling on the second or third gear. The car just missed the lamp standard on the opposite side of the road, knocked down a man, continued at a wild pace turned around and finished inside Herford Street. Estimated speed: twenty to twenty-five miles an hour. Witnesses had to move away sharply to prevent being knocked down. Mr Strong had only been driving a car for five weeks, and on this night put his foot on the accelerator instead of the brake. The consequence was that the more he applied pressure to what he thought was the brake and greater was the speed of the car. There was no doubt the estimate of the speed was exaggerated, but the incident did scatter the crowd. It was a pure accident and not a question of wilful misconduct or careless driving. Defendant bore out his solicitor’s statement and said that when he saw the people he was excited and nervous and thought he did quite well to miss the people as he did. The case was found proved, though the magistrates accepted the defendant’s explanation. A fine of £10 was imposed £1 5s special costs. 1920 17th February – Woman (daily) Wanted for cooking and house work; also Girl for Housework and assist bar, lie in Coventry – Coventry Arms. 1923 30th July – Coventry Police Court: Mr Marson (Ironmonger) had ‘two’ drinks on Saturday 20th July in the Coventry Arms. At 2:15 pm the police were called to eject him for being drunk and disorderly. It took four officers to remove Mr Marson to the police station, St Marys Street. The police report he was very drunk, using filthy language. During his ejection one of the officer’s trousers were torn beyond repair. During his night in the cell, Mr Marson caused considerable damage. Local reports suggest Mr Marson had sadly turned to drink in recent years. The Bench considered Mr Marson’s position in the city as well-known trades man for some years, decided to be lenient. For being drunk and disorderly he would be fined 40s and for the damage he would have to pay a fine of £5 in addition to the damage of (£10, 16s 6d). 1924 12th April – Temporary licence transfer of the “The Coventry Arms” Smithford Street from Thomas Strong to Edward Reynolds. 1924 14th May – Good cook general required; good references Evenings off – Apply Coventry Arms Broadgate. 1924 29th May – Licencing Justice: Application to extend hours of opening for city centre public houses. Estimated that 1,000 to 1,500 country people visited Coventry on Friday afternoons. Of which 200 or 300 are farmers resulting in a good deal of money being spent with the tradesmen. 1924 5th July – Lost black and white fox terrier information or return to Coventry arms, Broadgate, Coventry. 1924 2nd September – Bar General wanted must be used to business. Good references essential apply Coventry Arms Broadgate. 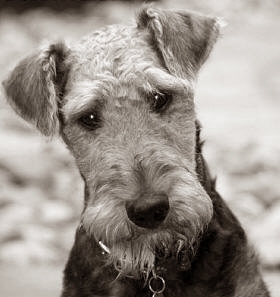 1924 4th October – Lost white wire-haired Fox Terrier puppy. Name “Roy” Finder rewarded, return to Coventry Arms, Broadgate. 1924 15th October – Barmaid (Smart) wanted week-ends Fridays and Saturdays Apply Coventry Arms Broadgate. 1924 25th November – Bar General wanted. Good home and wages, must be used to business. Closed Sundays references essential Apply Coventry Arms Broadgate. 1924 3rd November – Cook General (good) wanted; good home and wages – Apply Coventry Arms, Broadgate. 1924 27th November – Bar General wanted, good home and wages, must be used to business. Closed Sundays references essential – Apply Coventry Arms Broadgate. It was requested that the hours of opening be from 2.30 pm to 4.30 pm on each firday afternoon which coincided approximately with the times of the arrival and departure of the farmers. The facility would be treated as a privilege and would not be abused in any way. 1925 22nd / 23rd July – Agricultural show held in Coventry. Pubs in town including the Coventry Arms allowed to open 2pm – 6pm. Last time the show came to Coventry was five years preivously. 1926 3rd February – Barmaid wanted weekends , quick trade – Apply Coventry Arms. 1927 4th May – Bar General wanted, wages £1 per week live in, closed Sundays good references essential apply Coventry Arms. 1927 27th June – Aftermath of the carnival – Mrs F. Wallace was trying to climb on to one of the window sills outside the Coventry Arms in order to get a good view of the Carnival Procession, when she slipped and fell to the ground cutting her head. She was detained in Hospital. 1927 23rd September – Cook General wanted must be good plain cook. Wanted £1 week live in references required Apply Coventry Arms. 1927 19th December – Coventry Arms allowed to open at 5 pm next Thursday instead of 6 pm on the occasion o Waratahs’ match with Warwickshire. – What’s the Waratah’s match? – click here for Wikki page. 1928 2nd March – Corporation in negotiations with owners to purchase the property for street widening. The General Works Committee Invites Tenders for Demolition of the Coventry Arms & National Provincial Bank Premises Smithford Street. 1928 13th April – The Brewers plan to pay £2,000 to the corporation to surrender The Coventry Arms licence. 1928 21st June – Bar General Wanted, experienced, smart and quick. Wages £1 weekly. Closed Sundays good references essential – Apply Coventry Arms Broadgate, Coventry. 1928 10th July – Bar General wanted experienced, smart and quick. Good referneces essential. Wages £1 week. Closed Sunday – Apply Coventry Arms Broadgate. 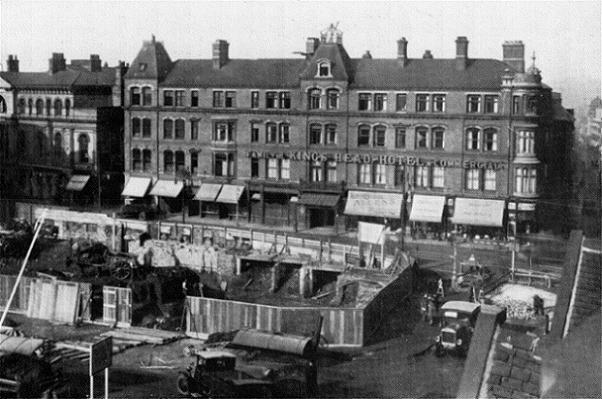 1928 11th September – Demolition of Johnson and Mason’s Premises behind Coventry Arms on Hertford Street in progress. Great difficulty will be experienced in taking down the front portion of the premises which is fifty feet high. Messrs W.H. Jones and Son of Lockhurst lane await the ‘ownership’ of the Coventry Arms. In the foundations of Messrs Johnson and Mason’s a number of building stones have been found that are thought to belong to the Coventry Castle of ancient days or the old monastery which was destroyed by Henry VIII. 1928 15th October – Magistrates Court listing of a case for possession of the Coventry Arms. Case labelled “Mayor & Corporation of Coventry Vs. Edward Reynolds” The case was dropped before it was heard in court. 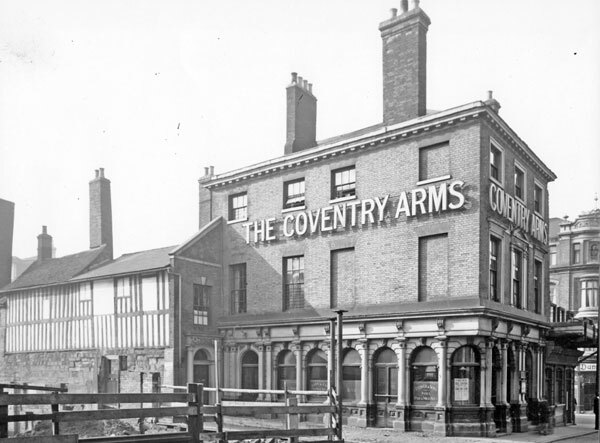 1928 29th October – Corporation takes possession of the Coventry Arms pub portion. Possession of the dwelling areas to be taken on the 5th November. 1928 7th November – The famed 17th-century oak panelling in one of the ground floor rooms is to be carefully removed for safe keeping. The woodwork includes a huge carved oak fireplace reaching from the floor to ceiling with the date 1621. When the panelling was removed, a 14th century carved stone fireplace was uncovered in marvellous condition. Approximately 9ft 6″ high, 8ft 6″ wide, with a depth of 12″. Originally constructed with an open hearth, with a wide chimney. The open fireplace allowed for approximately 4ft high and about 8ft wide. Above the fireplace, there is a carved frieze approximately 8ft wide, 2ft 6″ high 10″ thick. Containing five panels each with a shield, upon traces of coats of arms can be seen. The central panel contains a carved figure of an ecclesiastical character. The fire place obvioyusly came from a building of great wealth and importance. Above the frieze is a wide stone recess, providing a stone shelf while along the top is a further stone lintel containing handsome mouldings, with a further central figure that has a bearded and folded arms. Unfortunaltey the concentrated heat upon one side of the fireplace has crumbled the stonework. The stone fireplace is to be carefully removed. A second discovery – In the room above there was a second oak panelled apartment. Again when the panelling was removed second stone fireplace was discovered, situated immediately above the one already described. Though somewhat similar in size the upstairs fireplace is not so lavishly ornamented as the lower one. It is 9ft high 6ft 2 in wide and has a carved frieze rail 1ft 6 inch high. The panel is diamond shaped about 11 inches square also containing shields. The coats of arms and a gild lion can be clearly seen. 1928 8th November A party from the Corporation, including the Mayor inspected the wonderful old carved stone fireplaces discovered in the “Coventry Arms” demolition. 1928 13th December Lost white fox terrier Dog address collar Coventry Arms Broadgate please return to 2 St Osburgs Road or Police Station – Reward.